What’s going on in my area? Suggest It gives its users the best and most up-to-date answers to this question. The app is a digital announcement board for local events. Users can add events, browse by place and time, as well as view other users’ agendas to find exciting social opportunities. An app which will help discover various types of events in an area. Enabling users to: add events; browse by place, time and type; view each other's agendas and use calendar integration. 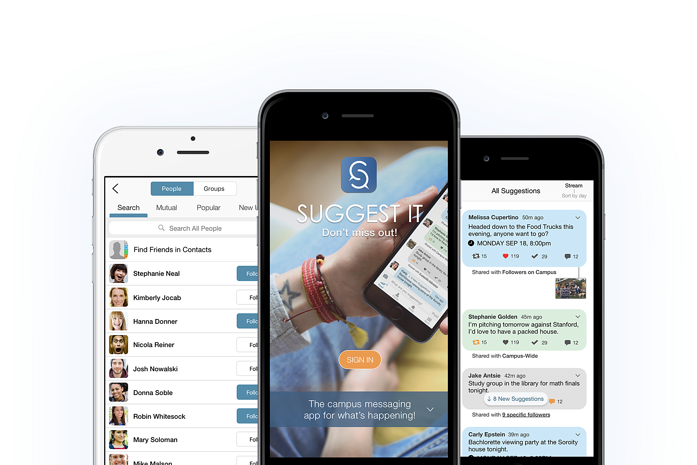 User comments, shares and suggestions, as well as invitations to join users’ events. Netguru proposed the most cost-effective solution in the shortest possible time frame and came up with a 1st phase roadmap for a minimum viable product (MVP) with fewer features than previously planned. Revamping the existing app, reviewing the frontend code and updating it to accommodate the new design. Revising the UI code and logic for all screens and adjusting it to fit the new design, modifying app navigation. Working with an 8 hour-difference between timezones but maintaining transparency and constant feedback. Work began with only iOS developers, but the team expanded to other fields. Netguru's developers, project managers and quality assurance experts suggest improvements whenever they see the need for them. This is how we came up with a number of UX/UI ideas and in-app solutions that delight users. Redesign of the iOS app and website, reducing the app's size by a factor of 3. Integrating several UX/UI ideas and in-app solutions, such as button design, screen designs and user flow. Weekly standups with the backend team, which greatly improved communication.